Welcome to another edition of THURSDAY THOUGHTS, my weekly blog series where I celebrate words and offer fellow writers (published or aspiring), avid readers and general word nerds my own ideas and suggestions for kindling the imagination including tools, websites and other sources I have stumbled upon that may help you have some fun with words. This week, I share a game that a good friend sent to me that promotes the long lost art of storytelling. Get ready for a word game unlike any other. 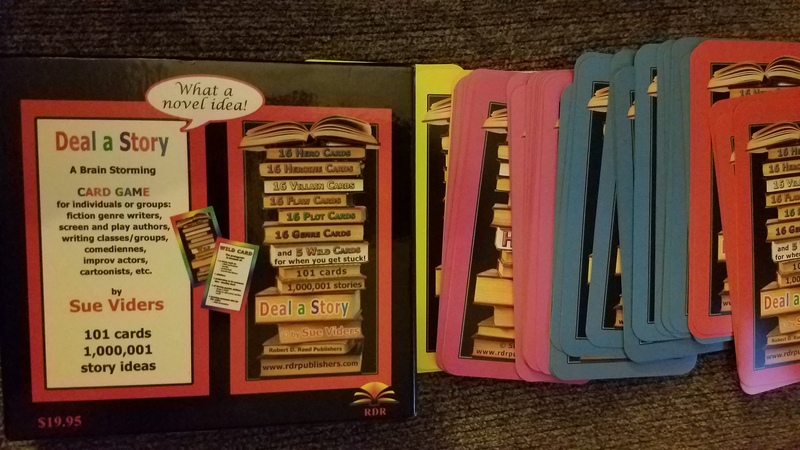 Let’s play… Deal a Story! I received creator Sue Viders’ unique card game from a good friend of mine as a gift at the holidays. I don’t know if he realized at the time how perfect his timing was. I haven’t been shy out here in sharing my overall writer’s block for the past few years. 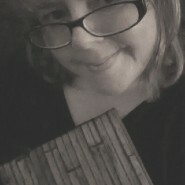 Most of my writing during that time has been in the form of articles, blogs and dribbles of micropoetry here and there. But I have made only a few feeble attempts at returning to creative works for myself or writing on a larger scale. I have not birthed any short stories, anthologies or books since my last release in 2015. This gift arrived at a time when I was contemplating a return to those efforts in the new year. While I have not begun any new works, I will say that I am slowly regaining my passion for writing and have dedicated myself to writing daily through my blog. It’s a start. And additional tools like card games such as Deal a Story are the extra gentle push I need. 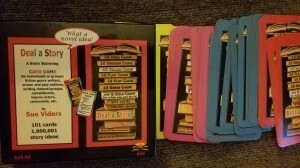 This clever card game devised by a writing teacher and author can be a fun, unsuspecting tickle of inspiration for a writer in between projects who wants to keep the creative juices flowing or for someone like me, a lost writer who may need to find her way back to the words. 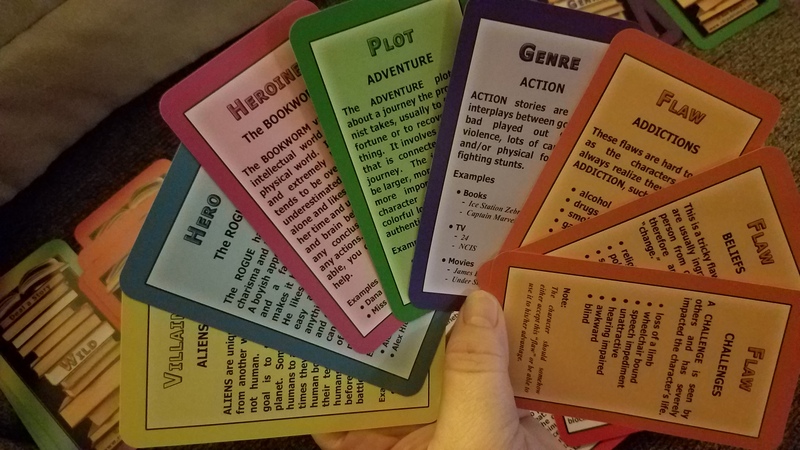 Here’s how it works: a deck is comprised of 101 cards with six key categories of 16 cards each- hero, heroine, villain, plot, genre and flaws. Genres can be anything from suspense and horror to historical and inspirational. Flaws represent those aspects of a character that he or she is faced with and its impact on their words, actions and motives. Flaws might be addictions, beliefs that present obstacles or other challenges the character might face such as a physical or mental impairment. In each round, a player chooses a card from each group and builds a hand that is the making of a story. 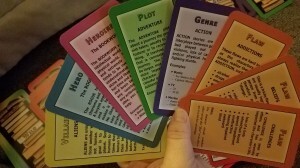 In the event a player gets stuck, there are five Wild cards to offer ideas for moving the story forward. The beauty of Deal a Story is that there are no winners or losers — only stories to be imagined and written. It doesn’t require other people yet the game can be just as fun in a group setting as a solo game. Viders notes she has used the card game in writing workshops as a brainstorming tool to fuel ideas and with groups to encourage collaboration and creativity to build a great story together through the fusion of ideas. “It helps people energize their imagination and think outside the box,” she says. Deal a Story is listed for purchase on Amazon.com as well as on its publishers’ site, with discounts available for bulk purchases, which is particularly helpful for writers’ groups, writing classes or other groups that may require a larger quantity. If you are a writer who has been struggling with getting that flow back, I highly suggest checking out this card game. At the very least you’ll have some fun concocting mini-stories with the word prompts. I put this question out to my fellow writers: what writing or word games have you engaged in before and how did they affect you as writer or reader? Did you find that they helped motivate you to write again? I’d love to hear from you. You can leave a comment here or email me at chris@chriskuhnauthor.com. As always, thanks for reading. ~ Chris K.
Share the post "Thursday Thoughts: Deal a Story"